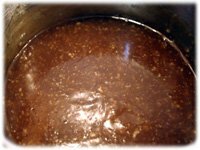 This traditional Honey Garlic sauce recipe is a great alternative when you're looking for something completely different from regular tomato barbecue sauce flavors. When would you use this? It's really good on chicken and shrimp but give some Honey Garlic BBQ Pork Ribs a try. The rib marinade and dipping sauce uses slightly different ingredients but the sweet and sticky honey garlic taste is the same. Or, if this traditional flavor isn't what you're looking for we've also got this new barbecue flavored honey garlic sauce that may interest you. 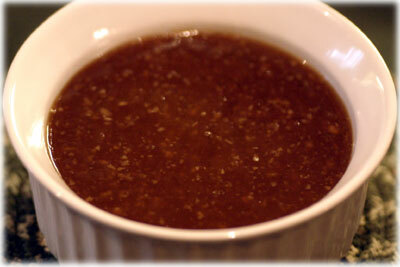 Honey is a natural sweetener and it's thick smooth texture is what gives this recipe it's full body. It sticks to just about anything and makes a great delivery system for all that garlic! Be sure to check out this fantastic honey garlic chicken wing recipe, it's the main reason this garlic sauce recipe was developed. In a medium sauce pan combine all of the ingredients and bring to a gentle boil. If you'd like it thicker, combine 1 tablespoon cornstarch with 1/4 cup cold water and stir into the honey garlic sauce. Give it a couple minutes to thicken. Repeat if it's still not thick enough for you. Cover and set aside or refrigerate until you're ready to use it.